A kind of announcement 3. 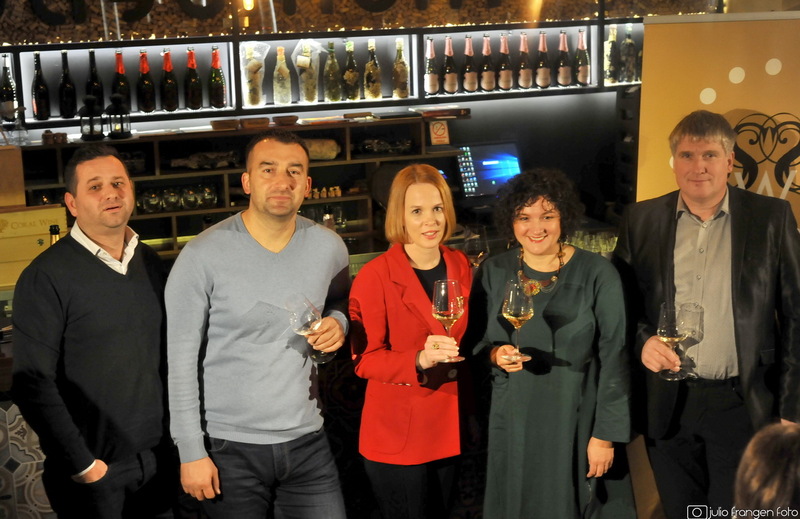 Salon of Sparkling Wine Zagreb which will be held at the Dubrovnik 1 Hotel. 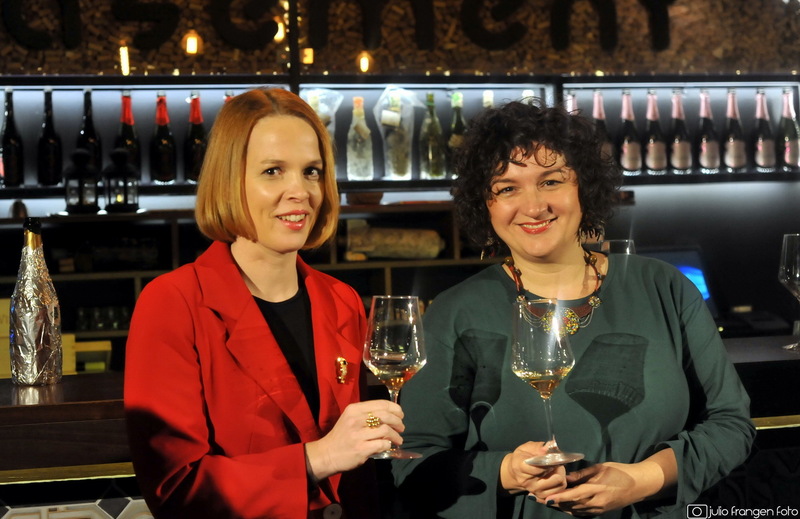 February was the introduction of three producers (Sanabor, Kolarić, Barun) in organization Alphabet of fine snacks in Basement, which were among the first to report as exhibitors to be 40, from Croatia, but abroad. Two weeks before the Zagreb Salon, announced by the director prof. Marija Vukelić, 6 will be held in Ljubljana. 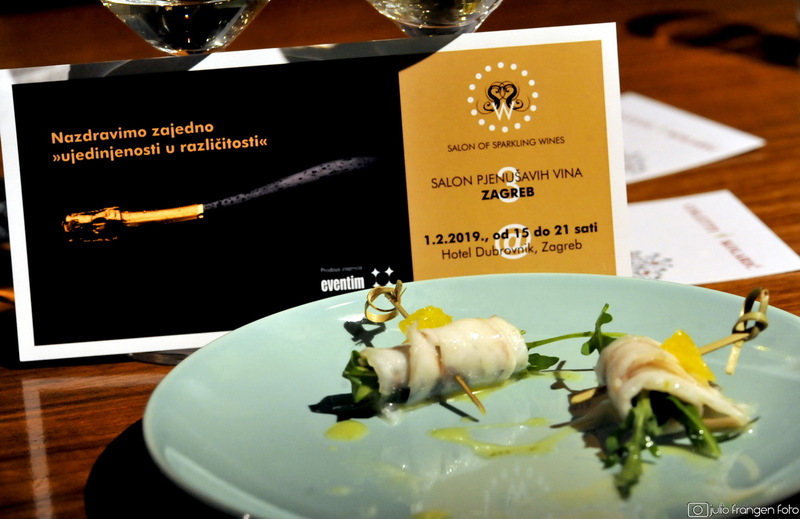 in line with the Salon of Scorpio wines, and he briefly presented Dr. Nina Levičnik and announced the expansion of the salon network to which they represented restless wine with bubbles to spread the culture of sparkling drinks that can be enjoyed every day, and not just on special occasions, and can be perfectly blended with a variety of dishes. In Basement, in an interesting way - a somewhat blind taste that all you heard simply poured into full concentration - presented a total of 6 sparkling wines: 3 Slovenian winery Sanabor, and 3 croatia: winery Kolarić has brought two, a Baron winery a sparkling wine with which the served bites are matched with the offered sparkling wines. Igor Sanabor, a young Slovenian winery and his family have been producing sparkling wines for nearly fifteen years near Sežana / Trsta, near Štanjela. They also offer a quiet wine whose production started before the 4 generation. Currently, they offer several vinegar labels with grape bites that grow on 6 hectares of terraced vineyards between Vipava and Krasa. All sparkling products are produced by a classical method and minimally dispose of the 3-4 years in the yeast. 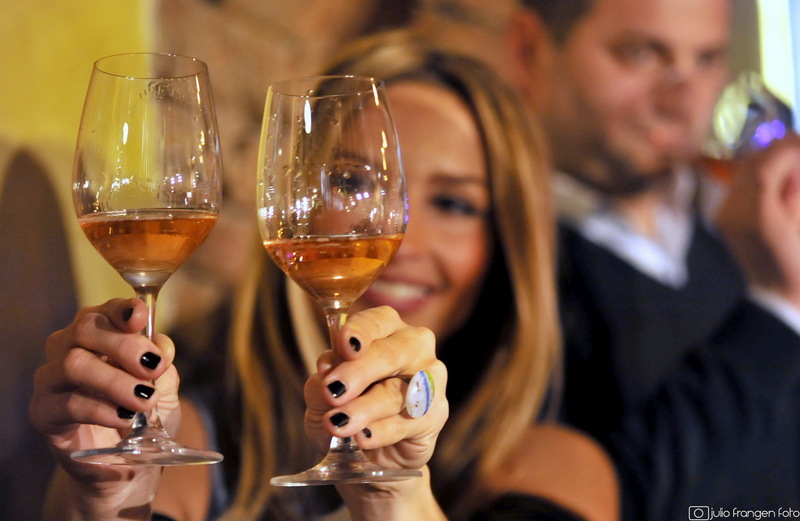 The base of their sparkling wines is malvasia, black pinot, teran, musk, and a combination of chardonnaya and rebula. In Zagreb, we first tried the NV (non vintage) sparkling Lucidia of rebula and chardonnaya, the brut nature Pallidia of Istrian malvasia, and the rosé extra brut sparkling Floridia from the black pinot. The grapes from different terroirs (karst red and Vipavski lapor) are reflected in the variety and elegance of their sparkling wines. Lucidia is an extra brut (5 gram of non-stick sugar) makes lighter, aperitive sparkling as its name suggests, nice pearls. It is made by 70% rebula and 30% chardonnaya, is a simpler structure, expressed in freshness, and has only two years in leaven that is why it is longer. Another extra brutal but pink color, Floridia, is made of black pineapple and as an aperitif it can be served with raw and dried fish, sea food, various cheeses and poultry dishes. The smell of karstic mineral-rich raspberry on the edge of Vipavska valley is complemented by the mature taste of wild cherry - expected fruitfully and freshly. 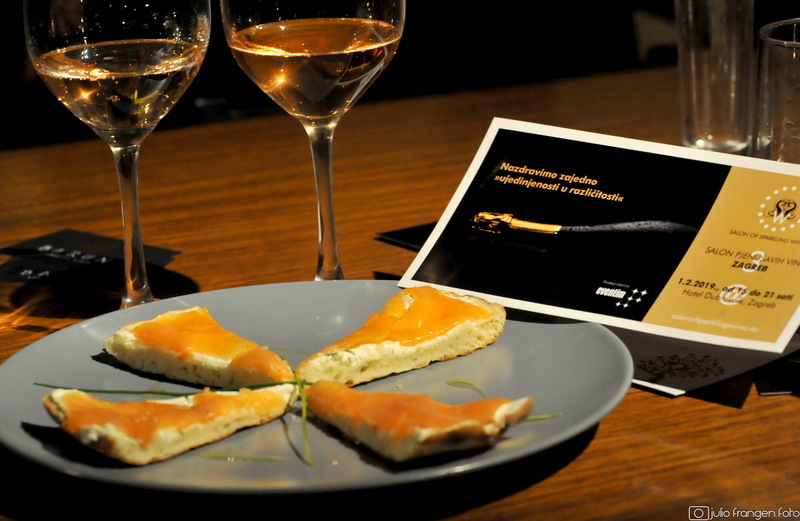 Pallidia, brut nature (less than 3g / l of sugar, without the addition of liqueur) sparkling wine made from malvasia is the best-selling Sanabor's champagne, resting on yeast 4 years. Long-lasting foaming and fine bubbles are an introduction to the noble taste of local malvasia with the scent of citrus fruit and the crust of bread. Fish, poultry and pasta are a nice pâté of this mature, characteristically sparkling wine. 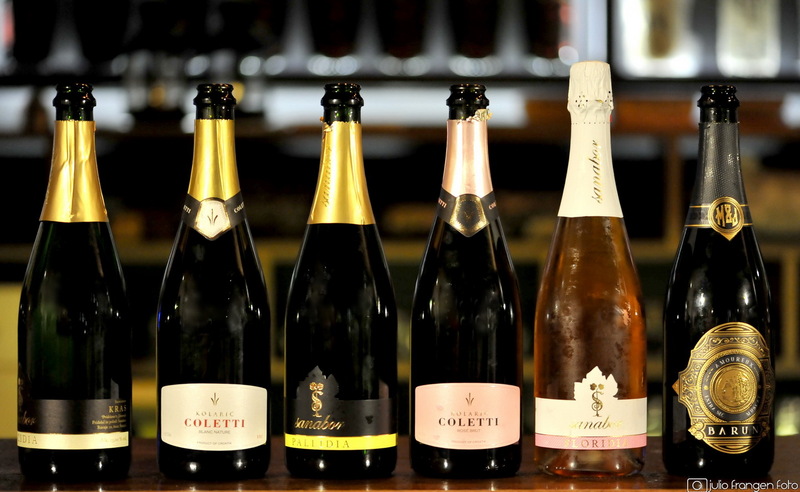 Franjo Kolarić, one of the more experienced pleasing winemakers introduced their two sparkling wines under the brand Coletti which produces a classical method and which is on leaven for up to two years. Of the total capacity of the winery (120.000 liters), 15 is one of the thousands of sparkling wines that are mostly sold in restaurants, grapes are grown on 6 hectares and 30.000 plants. For Colts brut nature, (not dosage), basal wine used was old plebytic varieties (50%), rizling (30%) and chardonnay (20%). He spent two years in leaven, retaining the mineral, freshness and acid that the pleasing vineyard is known for, and as Franjo says - you can drink it instead of breakfast. Colts brut nature Rosé is made of black pinot, macerated 4-5 hours - retained the grape varieties that are most suitable for the production of pink sparkling wines. Joseph-Stephan Špoljar Barundić is presented with its own label Barun from small shop winery in Krašić, where they produce grapes from 5 hectares of vineyards planted in the western part of Plešivica vineyards. Of the total wine production (30.000 Bottle), half refers to the sparkling wine of the varieties of white manzona (extra brut), small yields and expressed acids, the other is the Barun rosé label, the sparkling wine produced by the black pinot, and the third is - unique male sparkling wine amoureux which we tried with homemade prepared sweets. Early berries have retained primary aromas, so it is tempting, delicious, with sufficient amounts of acid essential for sparkling, with the addition of liqueurs from skimmed berries harvested directly from the cockroach.